Muscular dystrophies are congenital disorders that result in weakening and loss of skeletal muscle. Many muscular dystrophy phenotypes are also accompanied by cardiac manifestations, such as cardiomyopathy and cardiac arrhythmias. The plasma membrane-localized, cAMP-binding protein POPDC1 is abundant in striated muscle, and in animal models, mutations in POPDC-encoding genes result in both skeletal and cardiac muscle dysfunction. Despite the strong link to cardiac and skeletal muscle pathology in model organisms, POPDC1 mutations are not associated with human muscular dystrophies. Roland Schindler, Chiara Scotton, Jianguo Zhang, and colleagues at Imperial College London, University of Ferrara, and BGI-Shenzhen have identified a missense mutation in POPDC1 (POPDC1 S191F) in a family with limb-girdle muscular dystrophy (LGMD) and cardiac arrhythmia that was only present in affected individuals. Compared to WT protein, POPDC1S191F exhibited recued cAMP affinity and impaired membrane trafficking, and overexpression of the mutant protein in murine cardiac cells altered action potential properties. Introduction of the homologous mutation into a zebrafish model produced both skeletal and cardiac muscle phenotypes that resembled those observed in patients. Together, these results reveal that a POPDC1 mutation is responsible for pathologies observed in a rare form of LGMD with cardiac arrhythmia. The accompanying image shows the tail musculature of popdc1S191F/S191F (top) and WT (bottom) zebrafish. 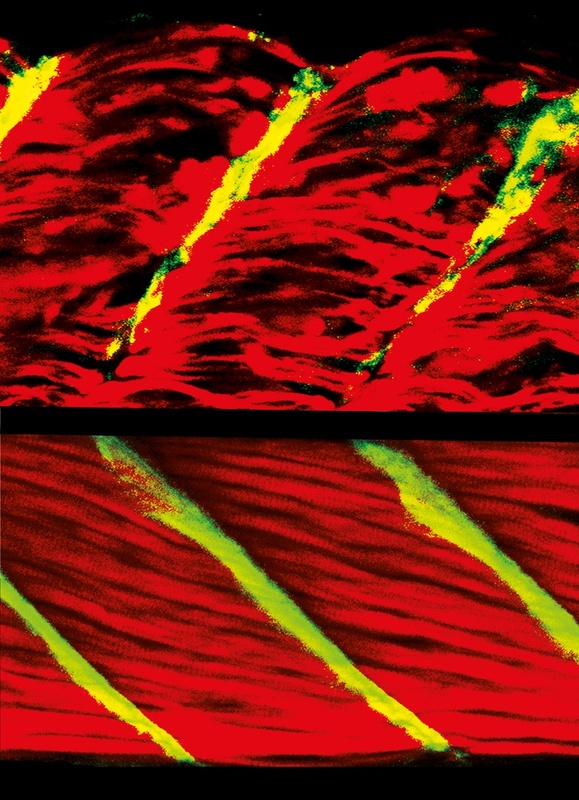 Note the detachment and retraction of muscle fibers (actin, red) from the myotendinous junction (green, vinculin) in the mutant Popdc1-expressing animal. Citation Information: J Clin Invest. 2016;126(1):239-253. https://doi.org/10.1172/JCI79562.